Content: Panax Ginseng semisolid liquid extract (made of 20Y old root). Ginseng can be used to improve the overall health of human being. It increases a sense of wellbeing and stamina, and improves both mental and physical performance. Ginseng can be used to help with erectile dysfunction, hepatitis C, and symptoms relating to menopause, and can also be used for lowering blood glucose levels and controlling blood pressure. The root of panax ginseng contains several active substances called ginsenosides or panaxosides that are thought to be responsible for the medicinal effects of the herb. Because of its adaptogenic effects, it is widely used to lower cholesterol, increase energy and endurance, reduce fatigue and the effects of stress, and prevent infections. Ginseng is one of the most effective anti-aging supplements, with the capability of alleviating some major effects of aging such as degeneration of the blood system, and increasing mental and physical capacity. Ginseng due to its adaptogens effects is widely used to lower cholesterol, increase energy and endurance, reduce fatique and effects of stress and prevent infections. Recent studies have shown that ginseng enhance libido and copulatory performance. These effects of ginseng may not be due to changes in hormone secretion, but to the direct effects of ginseng, or its ginsenoside components, on the central nervous system and gonadal tissues. There is good evidence that ginsenosides can facilitate penile erection by directly inducing the vasodilatation and relaxation of penile corpus cavernosa. Moreover, the effects of ginseng on the corpus cavernosa appear to be mediated by the release of nitric oxide from endothelial cells and from nerves that surround the vessels. According to recent findings, that ginseng treatment decreases prolactin secretion, which also suggests a direct effect of ginseng at the level of the pituitary gland. High levels of prolactin inhibit libido. Ginseng appears to help people with diabetes. A limited study performed in March 2000 at the University of Toronto showed that ginseng could lower blood sugar 20% more than placebo. Ginseng is one of the most effective anti-aging supplements. It can alleviate some major effects of aging, such as degeneration of the blood system, and increase mental and physical capacity. Taking ginseng supplement through the winter appears to help the immune system fight off colds. Ginseng has compounds that benefit nitric oxide production which helps dilate blood vessels. This may partially account for the improvement in erectile dysfunction. Ginseng has been found to be helpful in enhancing energy and for sexual vitality. Ginseng is used in traditional Chinese medicine to improve stamina and combat fatigue and stress. We prefer ginseng not be taken daily for prolonged periods. 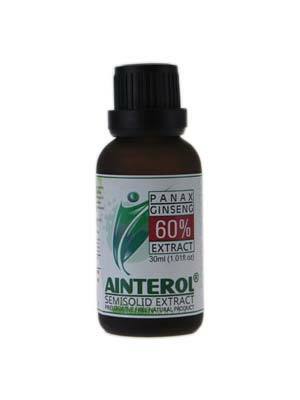 As a general rule, you may consider taking 100mg of panax ginseng extract 1-3 times in a week (a week off each month). This is a rough guideline that you can adapt to your own unique needs. Insomnia is a common side effect from ginseng overuse when it’s combined in high doses with other herbs or nutrients that cause alertness. High dosages of ginseng can cause overstimulation, restlessness, rapid heart beat, anxiety, headache, and insomnia. Just with any medication or supplement, the right dosage can be quite helpful while an excessive amount can lead to unpleasant adverse effects. Discuss with your doctor before using a ginseng product if you have a heart condition, are taking blood pressure pills, hormone medications, anti-depressants, or have a serious health condition. Patients being treated with the blood-thinning drug Coumadin (warfarin) should probably avoid using ginseng, since ginseng seems to reduce the drug's effects. Ginseng use for two weeks was tied to a significant reduction in the INR, meaning that the blood was now less thin and more prone to clotting. Ginseng should be used cautiously in those with heart disease. Keep the dosage low in order to prevent heart racing or high blood pressure.